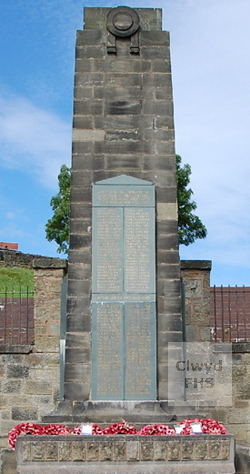 The Cefn Mawr War Memorial commemorates those local men and women who were killed in war. The memorial takes the form of a stone obelisk with slate tablets inscribed with gilt lettering and stands in Plaskynaston Lane. It was dedicated on 30 April 1921. Cefn Mawr is a village overlooking the River Dee in the community of Cefn, in the County Borough of Wrexham, and in the ecclesiastical parish of Rhosymedre. The community of Cefn includes the villages and hamlets of Cefn Mawr, Cefn Bychan, Acrefair, Penybryn, Trefynant, Abernant, Newbridge, Plas Madoc and Rhosymedre. Until 1974 the area was part of historic Denbighshire, and between 1974 and 1996 part of the county of Clwyd. 159301 Royal Field Artillery ("C" Bty. 70th Bde.) 4 May 1917 Adopted son of Mr & Mrs John Moreton, Minshalls Croft, King Street, Cefn Mawr. Duisans British Cemetery, Etrun, Pas de Calais, France. (2nd Bn.) 5 Nov 1916 19 Son of the late Charles & Alice Ann Biggs of 22, Park Road, Rhosymedre. Thiepval Memorial, Somme, France. Manchester Regiment 29 Mar 1917 22 Born Stockport, Cheshire, England. Son of James & Mercy Boon, of Temple Road, Buxton, Derbyshire, England. Former resident of Brooklea and Trevor House in Cefn. Killed in a flying accident near Coventry, Warwickshire, England. London Road Cemetery, Coventry, Warwickshire, England. (6th Bn.) 15 Feb 1919 37 Born in Tyldesley, Lancashire, England. Son of Adam & Mary Ann Bowen, of Dolydd Road, Cefn. Trefynant Cemetery, Cefn. (2nd Bn.) 23 Aug 1917 21 Son of Mrs Mary Buffey, of 70, High Street, Cefn. Zuydcoote Military Cemetery, Nord, France. (3rd Coy.) 22 Jan 1918 35 Born in Cefn Bychan. Son of the late Randle Carden & Mary Ann Carden (nee Jones, later Hughes); husband of Miriam Carden of Coliseum Buildings, Subiaco, Western Australia, Australia. Hersin Communal Cemetery Extension, Pas de Calais, France. (55th Kite Balloon Sect.) 31 Dec 1917 31 Son of John & Catherine Cartwright, of 18, Queen Street, Cefn. Husband of Edith Harriet Hargreaves (formerly Cartwright) of 87, Saxon Street, Wrexham. Chatby Memorial, Alexandria, Egypt. (10th Bn.) 14 May 1917 25 Born Wigan, Lancashire, England. Son of Allan Henson Chew & Jessie Chew; husband of Eva Evelyn Chew (nee Jones), of Rhosymedre. Arras Memorial, Pas de Calais, France. (2nd Bn.) 24 Oct 1916 19 Son of John William Brough Cooke & Mary Jane Cook, of 6, Mount Pleasant, Cefn Mawr. Thiepval, Somme, France. (9th Bn.) 24 Mar 1918 19 Son of William & the late Elizabeth Cuffin, of Zion Street, Cefn Mawr Doullens Communal Cemetery Extension No. 1, Somme, France. (6th Bn.) 15 May 1918 19 Born at Cefn Mawr. Son of Henry & Elizabeth Ann Davies, of Bradford House, Llanfyllin, Montgomeryshire. Vailly British Cemetery, Aisne, France. (16th Bn.) 22 Apr 1918 19 Born in Huddersfield, Yorkshire, England. Son of Thomas Owen Davies & Elizabeth Davies of Cefn Mawr. Pozieres Memorial, Somme, France. 40561 Royal Army Medical Corps (92nd Field Ambulance) 28 Oct 1919 31 Son of Thomas & Mary Ann Davies, of Jubilee Cottage, High Street, Cefn Mawr. St. John's Churchyard, Rhosymedre. (5th Bn.) 27 Mar 1918 31 Son of James Davies of Waterloo House, Cefn Mawr, & the late Mrs Sydney Davies. Arras Memorial, Pas de Calais, France. (1st Bn.) 8 Sep 1918 26 Son of Joseph & Mary Davies, of 10, Brooke Street, Rhosymedre; husband of Florence Davies, of 15, Manor Street, Accrington, Lancashire, England. Ploegsteert Memorial Hainaut, Belgium. (9th Bn.) 14 Jun 1917 42 Husband of Mary Jane Davies, Bazaar Cottage, Crane Street, Cefn Mawr. Enlisted at Stockport, Cheshire, England. Bailleul Communal Cemetery Extension, Nord, France. Royal Welsh Fusiliers 27 Dec 1916 20 Bronfay Farm Military Cemetery, Bray-sur-Somme, Somme, France. 16983 Royal Welsh Fusiliers ("A" Coy. 13th Bn.) 30 May1916 22 Son of William & Esther Davis, of Allenby House, Newbridge. Rue-du-Bacquerot No.1 Military Cemetery, Laventie, France. (4th Bn.) 23 Mar 1918 26 Son of John & Catherine Edwards, of 25, Rock Hill, Cefn. Arras Memorial, Pas de Calais, France. (17th Bn.) 28 Sep 1918 18 Son of Benjamin & Lois Edwards, 9 Rock Place, High Street, Cefn Mawr. Terlincthun British Cemetery, Wimille, Pas de Calais, France. (4th Bn.) 9 May 1915 31 Husband of Mrs Margaret Ellen Ellis, of Glandwr, Acrefair. Le Touret Memorial, Pas de Calais, France. (2nd Field Amb.) 9 Sep 1916 25 Son of Mrs Evans, 5, High Street, Rhosymedre. Heilly Station Cemetery Mericourt - l'Abbe, Somme, France. (8th Bn.) 30 Jul 1918 34 Son of George & M J Evans; husband of Minnie Evans of Ruabon. Kirkee 1914 -1918 Memorial, India. (2nd Bn.) 2 Oct 1918 41 Son of Richard & Jane Evans, 27, Llangollen Terrace, Rhosymedre. St. John's Churchyard, Rhosymedre. 23187 Grenadier Guards(3rd Bn.) 29 Jun 1917 22 Son of Mr & Mrs George Evans, Lancaster Terrace, Acrefair. Mendinghem Military Cemetery, West-Vlaanderen, Belgium. (15th Bn.) 7 Sep 1917 31 Son of Thomas & Jane Evans, of Rose Hill Cottages, Cefn Mawr. Died at the Palace Hospital, Gloucester, England. Trefynant Cemetery, Cefn. 200722 Royal Welsh Fusiliers (1st/5th Bn.) 18 Jul 1918 31 Husband of Annie Evans, 21 Rock Road, Rhosymedre, Ruabon. Jerusalem War Cemetery, Israel and Palestine (including Gaza). (1st/4th Bn.) 28 Mar 1918 23 Son of Edwin and Rose Hannah Francis, Waterloo Building, Newbridge, Ruabon (1911 Wales Census) Honnechy British Cemetery, Nord, France. 242326 1st Bn. Queen's Own (Royal West Kent Regiment) 8 Oct 1917 31 Son of John Albert & Harriet Graham; husband of Prudence Ann Griffiths (formerly Graham), 26, Llangollen Terrace, Rhosymedre. Lijssenthoek Military Cemetery, Ieper, West Vlaanderen, Belgium. (19th Bn.) 24 Nov 1917 20 Son of David & Minnie Griffiths, 86, High Street, Cefn Mawr. Cambrai Memorial, Louverval, Nord, France. (4th Bn.) 6 Apr 1918 26 Son of Evan & Margaret A Griffiths. Native of Newbridge. Martinsart British Cemetery, Somme, France. (1st Bn.) 10 Apr 1915 18 Son of Mrs J Griffiths, of 2, Chapel Street, Rhosymedre; brother of Mr H Griffith, of 22, Russell Street, Cefn Mawr. Cabaret-Rouge British Cemetery, Souchez, Pas de Calais, France. ("C" Coy 4th Bn.) 31 Mar 1915 25 Son of John & Sarah Griffiths, Gwalia House Crane Street, Cefn Mawr. Le Touret Memorial, Pas de Calais, France. (17th Bn.) 31 Jul 1917 24 Son of Edward & Sarah Griffiths, of Mount Pleasant, Penybryn. Menin Gate Memorial, Ieper, West Vlaanderen, Belgium. 12 Feb 1919 24 Son of Peter Griffiths, of 10A Crane Street, Cefn Mawr, & the late Elizabeth Griffiths. St. John's Churchyard, Rhosymedre. (10th Bn.) 26 Sep 1917 30 Son of Mr & Mrs Zechariah Griffith High Street, Cefn, husband of Alice Griffiths, Bryngoleu Cottage, High Street, Cefn. Tyne Cot Memorial, Ieper, West-Vlaanderen, Belgium. 38144 South Staffordshire Regiment ( 2nd/5th Bn.) 26 Sep 1917 born in India Husband of Annie Hardie. Tyne Cot Memorial, West-Vlaanderen, Belgium. (82nd - 1st/2nd Home Counties - Field Amb.) 29 Sep 1918 32 Son of Thomas & Mary Ann Harrison, of Bryn Siriol, Acrefair. (Tunnelling Coy.) 3 May 1919 41 Husband of Annie Hewitt, of 2,Church Terrace, Rhosymedre. St. John's Churchyard, Rhosymedre. (1st Bn.) 30 Mar 1917 32 Son of Samuel & Hannah Hayward, of 12, Bowers Road, Acrefair; husband of Elizabeth Ann Heyward. Arras Memorial, Pas de Calais, France. (4th Bn.) 29 Dec 1914 23 Son of Edwin & Julia Holt, of Brookside, 14, High Street, Rhosymedre. Bethune Town Cemetery, Pas de Calais, France. (1st/7th Bn.) 5 Sep 1918 36 Born Trefynant. Son of John & Jane Howell, Ash Tree House, King Street, Cefn Mawr. Terlincthun British Cemetery, Wimille, Pas de Calais, France. (15th Bn.) 10 Jul 1916 36 Son of Edward Hughes, of 4, Rock Terrace, High Street, Cefn. London Welsh. Thiepval Memorial, Somme, France. (Military Foot Police) 7 Sep 1918 23 Only son of William & Elizabeth Hughes, of 17, Mount Pleasant, Cefn Mawr. Resident of Porthcawl, Glamorgan. Lembet Road Military Cemetery, Salonika (Thessalonika), Greece. (15th Bn. Depot) 16 Jul 1918 22 Son of John & Mary Hughes, of Cefn Mawr. St. John's Churchyard, Rhosymedre. Royal Army Service Corps 27 Aug 1917 26 Son of Thomas & Harriet Hughes, Brynteg, Acrefair. Thiepval Memorial, Somme, France. (2nd Bn.) 23 Apr 1916 36 Son of Mr & Mrs Thomas Hughes, of 25 Crane Street, Cefn. Husband of Mary Ellen Hughes, of 29, Peel Street, Dukinfield, Cheshire, England. Menin Gate Memorial, Ieper, West-Vlaanderen, Belgium. & Devon Regiment 24 Oct 1917 29 Son of Nathan & Annie Jackson, of 93, Clifton Road, Southport, Lancashire, England. Resident of Hawthorn Avenue, Acrefair. Husband of Rose E Jackson. The Huts Cemetery, West-Vlaanderen, Belgium. (4th Bn.) 4 May 1917 23 Born in Cefn Mawr. Son of George & Elizabeth Jones, of 43, Lord St., Hindsford, Atherton, Manchester, England. Formerly of 9, Brooke Street, Rhosymedre. Died at sea. Savona Memorial, Italy. (16th Bn.) 4 Nov 1918 23 Son of Richard & Eliza Jones, Hughes Row, Acrefair. Englefontaine British Cemetery, Nord, France. (1st Bn.) 8 Oct 1917 20 Son of Hugh & Margaret Jones, of, 50 Queen's Square, Rhosymedre. Tyne Cot Memorial, Ieper, West-Vlaanderen, Belgium. (254th Tunnelling Coy.) 7 Aug 1917 36 Born Stockton on Tees, Durham, England. Son of Richard & Margaret Jones, of Cefn Mawr; husband of Frances Phillips (formerly Jones), of Bowens Lane, Cefn Mawr. Mendinghem Military Cemetery, West-Vlaanderen, Belgium. (2/5 Bn.) Of Bronhaulog, High Street, Cefn. (X/55th Trench Mortar Bty.) 23 Mar 1917 27 Born Wavertree, Liverpool, England. Son of William & Laura Jones, of Owenâ€™s Terrace, Abernant. Vlamertinghe Military Cemetery, West-Vlaanderen, Belgium. Scottish Reg. 23 Jan 1919 19 Son of Samuel Thomas & Lydia Ann Jones, of 2, Clifton Terrace, Russell Street, Cefn Mawr. Southern Cemetery, Cologne, Nordrhein-Westfalen, Germany. William (H?) Of Bryn Golau, Cefn. Liverpool Regiment 26 Mar 1918 23 Son of Rosa Hannah & the late Edward Jones, of Penybryn. Beacon Cemetery, Sailly-Laurette, Somme, France. (14th Bn.) 8 Oct 1918 21 Only son of Walter a and Naomi Kenyon of Bryn View, Cefn. Prospect Hill Cemetery, Gouy, Aisne, France. Denbighshire Yeomanry 7 Oct 1917 25 Son of Miriam Kirk, of 9, Queen Street, Cefn. Tyne Cot Memorial, Ieper, West-Vlaanderen, Belgium. 2423 Household Cavalry and Cavalry of the Line (Household Battalion) 22 Feb 1917 18 Son of Robert & Sarah Ann Lee, Plascoch, Newbridge. Died of pneumonia at King Edward VII Hospital, Windsor, Berkshire, England. St. John's Churchyard, Rhosymedre. (10th Bn.) 25 May 1918 22 Son of Mr & Mrs. John Lewis, Webster Terrace, Well Street, Cefn Mawr. Hamel Military Cemetery, Beaumont-Hamel, Somme, France. (74th Bn.) 23 Sep 1918 23 Son of Anne Lloyd, of Queen Street, Cefn Mawr & the late David Lloyd. Vis-en-Artois Memorial, Pas de Calais, France. 6069 Royal Welsh Fusiliers (C" Company, 4th Battery.) 11 Mar 1915 34 Husband of Evelyn Evans (formerly Lloyd), 4, Tower Hill, Tref-y-Nant, Acrefair, Ruabon, Denbighshire. Bethune Town Cemetery, Pas de Calais, France. (10th Bn.) 13 Nov 1916 29 Born Stockport, Cheshire, England. Son of the late Mrs Annie Lloyd, of Woodwardâ€™s Rock, Rock Road, Rhosymedre. Thiepval Memorial, Somme, France. (4th Bn.) 3 Jun 1915 Son of Edward & Catherine Lloyd, Red Lion Inn, Cefn. Le Touret Memorial, Pas de Calais, France. 7785 Royal Army Medical Corps (43 CCS) 24 Sep 1922 35 Husband of Alice Macdonald, Stourton House, Acrefair, Ruabon. Trefynant Cemetery, Cefn. 200298 Royal Welsh Fusiliers (4th Reserve Bn.) 24 Dec 1917 31 Son of James Davie & Margaret Ann McLaren of 2, Copperas Hill, Penycae. Also named on the Penycae and Ruabon War Memorials. Ruabon Cemetery, Denbighshire. (24th Bn.) 11 Jul 1921 28 Son of Arthur James Mapp & Lucy Ellen Mapp (nee Gough), of Waterloo Terrace, Newbridge. St. John's Churchyard, Rhosymedre. (2nd Bn.) 4 May 1917 27 Son of Samuel Matthews, Burton Terrace, Acrefair. Enlisted at Bradford, Yorkshire, England. Died St. Albanâ€™s Hospital, Hertfordshire, England. Ruabon Cemetery. (4th Bn.) Sep 1921 37 He was reared by an Uncle & Aunt Mr & Mrs. W. Meredith, 30, Chapel Street, Rhosymedre. Discharged as unfit in 1917. Died at Bangor Military Hospital. St. John's Churchyard, Rhosymedre. (19th Bn.) 19 Dec 1917 24 Son of Charles and Jane Meredith, Waterloo Terrace, Cefn. Brother of William Henry Meredith (below). Bucquoy Road Cemetery, Ficheux, Pas de Calais, France. (17th Bn.) 6 Oct 1916 25 Son of Charles and Jane Meredith, Waterloo Terrace, Cefn. Brother of John Alfred Meredith (above). Husband of Mary Ann Meredith. Menin Gate Memorial, Ieper, West-Vlaanderen, Belgium. M/341215 Royal Army Service Corps (MT) Q1 1923 25 Son of John & Fanny Moreton, of 9, Crane Street, Cefn Mawr. Lived at Michells Croft, King Street, Cefn Mawr. (12th Bn.) 11 Aug 1916 19 Born in Cefn. Son of Enoch & Sally Morris, of Penybont Cottage, Penybont. Chocques Military Cemetery, Pas de Calais, France. (4th Bn.) 23 Jan 1917 32 Born Chirk. Son of James & Louisa Morris, Penybont Villas, Penybont; husband of Mrs Morris, Park Road, Newbridge. Basra Memorial, Iraq. 23 Aug 1916 34 Son of John & Elizabeth Nicholas, of 20, Chapel Street, Rhosymedre. Villers-Bretonneux Memorial, Somme, France. (2/9th Bn.) 9 Oct 1917 21 Son of William & Catherine Owens, Mile End Terrace, Acrefair. Enlisted at Denton, Lancashire, England. Tyne Cot Memorial, Ieper, West-Vlaanderen, Belgium. (8th Bn.) 10 Sep 1916 21 Son of William & Sarah Jane Parry, School House, Acrefair. Dantzig Alley British Cemetery, Mametz, Somme, France. (4th Bn.) 9 Mar 1915 25 Son of Charles & Mary Parry, of 24, Rock Villa, High Street, Cefn Mawr. Bethune Town Cemetery, Pas de Calais, France. 23 Oct 1918 29 Husband of Sarah Elizabeth Phillips, of the Plough Hotel, Rhosymedre. Canonne Farm British Cemetery, Sommaing, Nord, France. 90729, 7462 Machine Gun Corps (Infantry) (50th Bn.) formerly S. Lancs Regt. 14 Oct 1918 29 Son of Thomas & Catherine Price, of Waterloo Buildings, Cefn Bychan and later of 47, Hill Street, Ashton under Lyne, Lancashire, England. Brother of Morris Price (below). Vis-en-Artois Memorial, Pas de Calais, France. (4th Bn.) 8 Jun 1915 21 Son of Thomas & Catherine Price, of Waterloo Buildings, Cefn Bychan and later of 47, Hill Street, Ashton under Lyne, Lancashire, England. Brother of John Price (above) Bethune Town Cemetery, Pas de Calais, France. Sep 1916?? Of King Street, Cefn? (24th Denbighshire Yeomanry Bn.) 8 Sep 1918 26 Son of Elizabeth Pritchard, Fron View, Brownâ€™s Lane, Cefn Mawr. Twin brother of Robert Evan Pritchard (below). Bailleul Communal Cemetery Extension, Nord, France. (9th Bn.) 7 Jun 1917 21 Son of Margaret Ellen Gibbons, of 19, Tower Hill, Acrefair. Menin Gate Memorial, Ieper, West-Vlaanderen, Belgium. 25305 16th Bn. Royal Welsh Fusiliers 8 Nov 1918 28 Born in Cefn. Son of Stephen Rees and the late Catherine Rees, Vedwygoed Farm, Eyton, Wrexham. Also commemorated on the Bangor is y Coed War Memorial. Dourlers Communal Cemetery Extension, Nord, France. (4th Bn.) 13 Jun 1917 21 Born Llangollen. Son of John & E A Richards, Penyrochr, Newbridge. Lijssenthoek Military Cemetery, West-Vlaanderen, Belgium. (10th Bn.) 13 Nov 1916 20 Son of Mrs Susannah Richards, Hill Street, Cefn Mawr. Thiepval Memorial, Somme, France. (4th Bn.) 18 Aug 1918 36 Born Cefn Mawr. Heilly Station Cemetery, Mericourt-l'Abbe, Somme, France. 735861 Royal Field Artillery ("B" Bty. 265th Bde.) 22 Oct 1918 26 Son of John & Margaret Roberts, of 7, Lancaster Terrace, Acrefair. Jerusalem War Cemetery, Israel. (123rd Bd.) 31 Oct 1917 20 Son of Robert & Mary Jane Roberts, of Bryn View, Queen Street, Cefn Mawr. Outtersteene Communal Cemetery Extension, Bailleul, France. (10th Bn.) 30 Nov 1916 Stepson of Mr Joseph Reed, King Street, Cefn Mawr. Enlisted at Chesterfield, Derbyshire, England. Euston Road Cemetery, Colincamps, Somme, France. (8th Bn.) 4 Dec 1915 23 Born Oldham, Lancashire, England. Son of Charles & Mary H Robinson, of Tan y Lan, Ruabon; husband of Ada Robinson (nee Ellis), of 4, Chapel Street, Cefn Bychan. Green Hill Cemetery, Gallipoli, Turkey. (13th Bn.) 29 Jul 1917 30 Son of Walter & Maria Rowland, 15, Park Road, Rhosymedre. Bard Cottage Cemetery, Belgium. (19th Bn.) 27 Nov 1917 20 Grandson of the late John & Jane Simon, 12, Jolly Bank, Cefn Bychan. Rocquigny-Equancourt Road British Cemetery, Manancourt, Somme, France. (Denbighshire Hussars) 5 Feb 1915 36 Son of Ann Stephens, of Cefn Bychan; husband of Mary Elizabeth Stephens, of 26, Crane Street, Cefn Mawr. Drowned in the River Yare, in Suffolk, England. All Saints Churchyard, Worlingham, Suffolk, England. (13th Bn.) 1 Apr 1917 25 Born in Rhosymedre. Son of Edward & Frances Thomas, of Abernant. Longuenesse (St. Omer) Souvenir Cemetery, Pas de Calais, France. (4th Bn.) 6 Sep 1917 35 Son of Jonathan & Maria Thomas, of Penycae; husband of Margaret Maria Thomas, of 15, Hill Street, Cefn Mawr. Birr Cross Roads Cemetery, West-Vlaanderen, Belgium. (13th Bn.) 10 Jul 1916 21 Son of David & Mary Elizabeth Thomas, Park House, Church View, Rhosymedre. Dantzig Alley British Cemetery, Mametz, Somme, France. (103rd Field Amb.) 24 Jul 1918 30 Son of Thomas Thomas (shoemaker), of High Street, Cefn; husband of Mary E Thomas, of 17, Belgrave Road, Colwyn Bay, Denbighshire. Raperie British Cemetery, Villemontoire, Aisne, France. (15th Bn.) 19 Jul 1916 19 Son of Edward & Mary Thomas, of 3, Temple Vale Dolydd Lane, Cefn Mawr. Thiepval Memorial, Somme, France. Born Acrefair. Son of Timothy & Ann Tudor, of Russell Street, Cefn Mawr. (10th Bn.) 26 Sep 1917 Tyne Cot Memorial, Ieper, West-Vlaanderen, Belgium. (1st/4th Bn.) 6 Apr 1918 30 Son of John & C E Wilkes, of Mill House, Lower Cefn. Brother of William Wilkes (below). Martinsaart, British Cemetery, Somme, France. Son of John and Catharine Eliza Wilkes, Mill House, Lower Cefn. Brother of Jack Wilkes (above). Born in Llangollen. Son of John & Martha Williams; husband of Catherine Williams, Newbridge Terrace, Newbridge. (13th Bn.) 20 Feb 1916 21 Son of Robert & Eliza Williams, of 2, Bryn Gwilym, Dolydd Road, Lower Cefn. Guards Cemetery, Windy Corner, Cuinchy, Pas de Calais, France. (1st/4th Bn.) 18 Apr 1918 25 Son of Edward & Sarah Williams, of Jolly Bank, Newbridge. St. Sever Cemetery Extension, Rouen, Seine-Maritime, France. Franvillers Communal Cemetery Extension, Somme, France. (13th Bn.) 22 Apr 1918 32 Of the The Old Bird in Hand, Crane Street, Cefn Mawr. Pozieres Memorial, Somme, France. (22nd Bn.) 1 Jul 1916 24 Step son of Robert & Jane Jones, of Park House, Newbridge. Thiepval Memorial, Somme, France. Royal Welsh Fusiliers 13 Nov 1917 24 Son of David Richard & Elizabeth Emily Williams, of Oak Bank, Penbedw, Plas Isa. Brother of Thomas Henry Williams (below). Lijssenthoek Military Cemetery, West Vlaanderen, Belgium. (17th Bn.) 11 May 1916 18 Son of David Richard & Elizabeth Emily Williams, of Oak Bank, Penbedw, Plas Isa. Brother of Percy Vaughan Williams (above). Rue-du-Bacquerot No. 1 Military Cemetery, Laventie, Pas de Calais, France. (4th Bn.) 7 Oct 1916 28 Born Rhosymedre. Son of Joseph & Hannah Williams, of Ashton under Lyne, Lancashire, England; husband of Mrs Williams. Thiepval Memorial, Somme, France. (11th H.D. Bn.) 7 Mar 1940 51 Son of Charles & Alice Ann Biggs; husband of Elizabeth Biggs, Foresterâ€™s Arms, King Street, Cefn Mawr. St. John's Churchyard, Rhosymedre. Fred Royal Marines 26 Sep 1946 26 Son of Mr & Mrs George Blaze, 18 Plas yn Wern, Acrefair. Died at Meadowslee Hospital, Penyffordd, Flintshire. (405 RCAF Sqdn.) 9 May 1944 Son of Benjamin Denver Daniels & Violet Daniels; husband of Ethel Daniels, of Cefn. Chievres Communal Cemetery, Hanaut, Belgium. (2nd Bn).) 3 Jan 1945 32 Son of David Richard & Annie Davies, husband of Elizabeth Jane Davies, Trevor. Jonkerbos War Cemetery, Gelderland, Netherlands. (78 Sgn.) 20 Dec 1942 21 Son of Charles William & Florence Christina Edwards of Acrefair. Runnymede Memorial, Surrey, England. (8 Survey Regiment) 9 Jul 1944 20 Son of Caradog & Catherine Edwards of Minera. Assisi War Cemetery, Italy. Margaret Civilian 1 Oct 1940 19 Daughter of Thomas & Ellen A Edwards, of 34, Bron Berwyn, Cefn Mawr. Died at Birkenhead General Hospital, Cheshire, England. (3rd Regiment - 8th Bn. Royal Northumberland Fusiliers) 2 Feb 1945 29 Son of Lilian Edwards, 48, Burton Terrace, Acrefair. Son of Lilian Edwards; husband of Gwyneth Emily Edwards, of Chirk. Mierlo War Cemetery, Noord Brabant, Netherlands. 142009 Royal Air Force Volunteer Reserve (15 Sqdn.) 19 Feb 1943 Son of Tom & Mary Elizabeth Ethelston, of Cefn Mawr; husband of Christine Eve Ethelston. Runnymede Memorial, Surry, England. 4 Jul 1943? Son of Mr J Evans, 136 Bron Berwyn, Cefn. Husband of Mrs N Evans, 126, Bron Berwyn, Cefn. Died while Prisoner of War in Malaya. Malaya. Eifion W Royal Navy 16 Dec 1945 19 Son of Mr & Mrs H T Evans, The Bungalow, Dolydd Road, Cefn Mawr. St. John's Churchyard, Rhosymedre. (2nd Bn.) 26 Aug 1944 26 Son of Robert & Eleanor Evans, of Park Place, Newbridge. Husband of May Evans, of Birkenhead, Cheshire, England. Taukkan War Cemetery, Rangoon, Burma. (65 Field Regt.) 16 Oct 1943 28 Son of H & Mary Jane Evans, of Cefn Mawr. Minturno War Cemetery, Italy. HMS Dunedin 24 Nov 1941 33 Son of Frederick & Margaret Fenner; husband of Doris Fenner of Penycae. Torpedoed and sunk by German submarine off Brazil. Also commemorated on the Penycae War Memorial. Portsmouth Naval Memorial, Hampshire, England. (241 Bty., 77 H.A.A. Regt.) 4 Dec 1942 36 Son of Isaac & Alice Francis; husband of Dorothy Francis of Chirk. Sydney War Cemetery, New South Wales, Australia. (3rd Bn.) 28 May 1944 35 Son of John & Mary Goodwin; husband of Marie Elizabeth Goodwin of Cefn Mawr. Cassino War Cemetery, Italy. (4th Bn.) 2 Aug 1944 19 Son of Morris & Edith Hopwood of Oldham, Lancashire, England. Banneville-la-Campagne War Cemetery, Calvados, France. (6th Bn.) 1 Sep 1944 31 Son of Hugh & Catherine Jane Hughes; husband of Linda M Hughes, of Acrefair. Ruabon Cemetery. (1st Bn.) 25 May 1944 26 Of 3, Bazaar Cottage, Cefn. Taukkyan War Cemetery, Burma. 1895605 Royal Engineers 11 May 1940 24 Son of William Ferrie Humphreys & Bertha Emily Humphreys of Maelor House, Acrefair. Trefynant Cemetery, Cefn. (7th Bn.) 24 Feb 1945 29 Son of Robert and Sarah Humphreys. Lived at 104, High Street, Cefn. Died in India. Rangoon Memorial, Burma. 4188403 7th Royal Tank Regiment R.A.C. 15 Nov 1943 33 Husband of Sarah R Irving, of 18, Bowers Road, Acrefair. St. John's Churchyard, Rhosymedre. (4th Bn.) 19 Oct 1944 35 Son of Evan & Jane Jenkins. Husband of Rosa Jenkins, of 17, High Street, Rhosymedre. Uden War Cemetery, Noord-Brabant, Netherlands. Caradoc Royal Army Service Corps. 23 Nov 1945 Of Bowen's Lane, Cefn Mawr. (1st Bn.) 25 May 1940 24 Son of Edward Thomas Jones & Elizabeth Ann Jones, of The Laurels, Cefn Mawr. Doullens Communal Cemetery Extension No. 1, Arras, Somme France. (2nd Bn.) 30 Nov 1944 23 Son of Percival Burford & Myfanwy Jones of Cefn Mawr. Imphal War Cemetery, India. (Volunteer Reserve) 21 Sep 1944 Son of Mr & Mrs Harry Jones, of Bryn Goleu, Cefn. Husband of Iris Jones, of 15, Tower Hill, Trefynant, Acrefair. Singapore Memorial, Singapore. (H.M.S. President III) 3 Feb 1943 Son of Mr & Mrs T B Jones, of 86, Bron Berwyn, Cefn. Plymouth Navel Memorial, Devon, England. HMS Repulse 10 Dec 1941 26 Son of Albert & Kate Jones of Cefn Mawr. Plymouth Navel Memorial, Devon, England. (H.M.S. Furrows?) 11 Nov 1939 29 Son of Mr & Mrs Pryce Jones, Brynheulog, Minshall Croft, Cefn. Lived in Plymouth, Devon, England. (4th Bn.) 20 Sep 1944 28 Son of Edward & Mary Jones, of Cefn Mawr; husband of Sarah Jane Jones, of Cefn Mawr. Valkenswaard War Cemetery, Noord-Brabant, Netherlands. (7th Bn.) 28 Mar 1945 28 Son of Mr & Mrs Jones, of 9, Bro Gwilym Extension, Cefn. Reichswald Forest War Cemetery, Nordrhein-Westfalen, Germany. William Thomas R.A.F Son of Mr & Mrs Thomas Jones, High Street, Rhosymedre. 19 Oct 1944 28 Son of Mr & Mrs A Kempster, 29, Bro Gwilym Extension, Cefn. Husband of Iris Kempster, Cross Keys, Ponciau. Florence War Cemetery, Italy. (7th Bn.) 1 Feb 1941 Son of Alfred & Lizzie Kempster. Husband of Dorothy Kempster of Gobowen, Shropshire, England. St. Barnabas Churchyard, Hengoed, Shropshire, England. (4th Bn.) 26 May 1940 36 Born Newbridge, Monmouthshire. Son of William & Lillian Lavender; husband of Dorothy Florence Lavender, of Acrefair. Saltdal Main Churchyard, Norway. (6th Bn.) 10 Feb 1945 32 Son of Mr & Mrs Morris of Penybont. Husband of Hilary Morris, of 8 Middle Street, Newbridge. Uden War Cemetery, Noord-Brabant, Netherlands. 1507041 Royal Air Force Volunteer Reserve 21 Nov 1942 21 Son of Robert Moss & Elsie Morris, of Cefn Mawr. Bone War Cemetery, Anaba, Algeria. (HMS Fleur de Lys) 14 Oct 1941 20 Son of James & Susannah Morris of Cefn Mawr. Sunk by German submarine, off |Gibraltar. Portsmouth Naval Memorial, Hampshire, England. 30 Jun 1943 Son of Richard & Alice Newton, of Cefn. Rangoon Memorial, Burma. PLY/X100666 Royal Marines 4 Aug 1946 31 Son of Charles & Mary Ann Owens of Acrefair. Trefynant Cemetery, Cefn. (5th Bn.) 27 Nov 1944 24 Mr & Mrs N Roberts, of 48, Bron Berwyn, Cefn. Husband of Mrs M B Roberts, of Polesworth, Warwickshire, England. Brunssum War Cemetery, Limburg, Netherlands. Arthur Royal Welsh Fusiliers 23 May 1940 41 Son of Mr & Mrs Edward Charles Roberts, of 7, Bro Gwilym Extension, Cefn. Glyn 12 Nov 1944 Son of Mr & Mrs Edward Roberts, of 10, Bryn Goleu, Cefn Mawr. Killed while trying to cross the Alps from Italy to France. 29 May 1940 30 Son of John & Priscilla Roberts; husband of Violet Ena Roberts, 32, Church Street, Rhosymedre. Dunkirk Town Cemetery, Nord, France. HMS Gloucester 22 May 1941 17 Son of Harry & S E Smith, of Cefn. Sunk by German dive-bombers north of Crete, Greece. Plymouth Naval Memorial, Devon, England. (4th Bn.) 28 Oct 1944 24 Son of Mr & Mrs Valentine, of, 24, Queen Street, Cefn Mawr. Husband of Mrs Nancy Valentine, of 32, Llangollen Terrace, Rhosymedre. Uden War Cemetery, Noord-Brabant, Netherlands. (8th Bn. - 2nd Bn. London Rifle Brigade) 23 Aug 1944 20 Son of John Llewelyn & Margaret Jane Watkin of Rhosymedre. St. Desir War Cemetery, Calvados, France.